Publica Slab is a slab serif typeface created by Marcus Sterz and published by FaceType which is serif typeface of Publica Sans & Publica Play. It was designed to be suitable for design purpose, magazine, headline, signage etc. It is available in 9 weights and their italics. Also is comes with a wide range of OpenType features (1-6). Have fun! 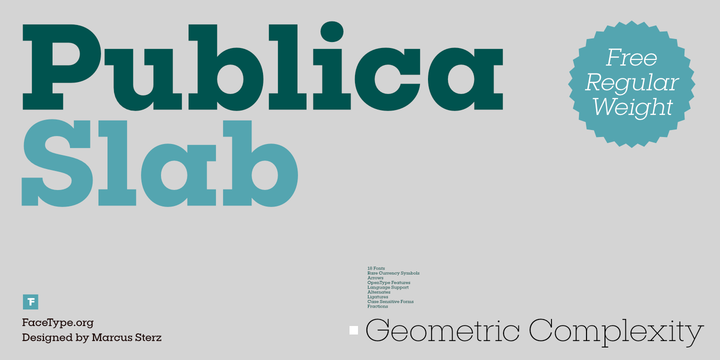 Note: “Publica Slab” is a trademark of FaceType. Price: starting from $24,00 for one font to $240,00 for all 18 fonts. A font description published on Tuesday, July 25th, 2017 in FaceType, Fonts, Marcus Sterz by Alexandra that has 2,523 views.